Pouch Designed For Camera Assistants. Designed specifically with the camera assistant in mind, allowing for easy storage of eyecups, insert slate, dry erase markers, tape measure, depth of field calculator, etc. 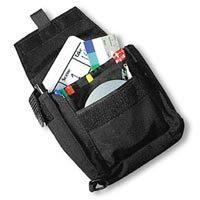 Features: 5 pockets, 9 various sized elastic loops and a D-ring. Dimensions: 8.5" L x 7.5" W x 2" D.